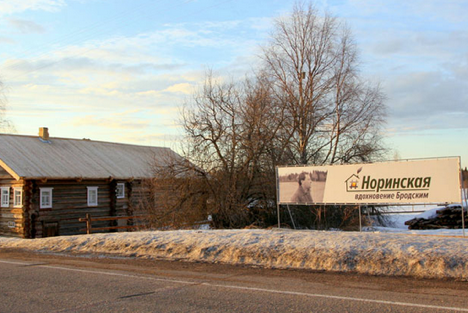 The first museum in the world dedicated to Joseph Brodsky has opened in the village of Norinskaya, Arkhangelsk Region, where the poet and Nobel Prize winner was exiled from March 1964 till October 1965. Joseph Brodsky was arrested in 1964 on the charge of parasitism, a popular article of the Soviet criminal code, and exiled for five years to Norinskaya village, Arkhangelsk Region. He served 18 months of his sentence. Brodsky kept himself busy during his exile; he wrote poems and published them in a local newspaper, worked on a collective farm, and photographed local life. He would photograph weddings, funerals and family celebrations in nearby villages, as well as take pictures for official documents. He also helped Taisita Pestereva, who he stayed with in exile, with the housework. According to local press reports, the project to establish a Brodsky museum in Norinskaya village was conceived two years ago and supported by dozens of eager participants from Arkhangelsk Region, St. Petersburg and Moscow. In July 2014 restoration work began in Norinskaya, and the small country cottage where Brodsky lived had been totally restored by the end of the year. In total the project cost 5 million rubles ($97,000). The museum’s exhibits consist of items that the poet used, such as a chair, a table, a couch, a kerosene lamp, a box for developing film, and the plywood cover of a package sent by Brodsky’s father from Leningrad (now St. Petersburg). Another museum was originally scheduled to open in St. Petersburg, where the poet was born, in time for the 75th anniversary of his birth. However, according to Nina Popova, the director of the Anna Akhmatova museum, it will now only open for a single day, May 24th, to show the early stages of the exposition, opening fully by the end of the year. Work on this museum in Brodsky’s apartment on Liteiny Avenue has already lasted for 16 years. It has been delayed several times due to problems first with relocating residents living there, then with ownership of the apartment and its condition.